An Act for the better Safety of His Majesty's Person. Bills from the H. C.
His Majesty acquainted with what passed at the Conference. Message to the H. C.
That the Lords are ready to give them Answer, concerning the Grievances complained of. For the Establishment of an Hospital, School, etc. by Mr. Sutton. Expedit. Schonnerus, Seelken, Benneken, and Rumbler's Naturalization. Keir, Abercromy, Chambers, etc. Naturalization. Sir Stephen Proctor, and his Counsel, at the Bar. His Hearing- and the Bill brought up against him from the H. C. referred to a Committee. Subsidy, etc. by the Temporalty. Safety of His Majesty's Person. Letter from His Majesty to this House, concerning the Contract. p. Epus. Cicestren. p. Ds. Ellesmere, Cancell. Angliæ. p. Comes Salisburiæ, Mag. Thesaur. Angliæ. p. Comes Notingham, Mag. Admirall. et Senescall. p. Ds. Willughby de Ersby. MEMORANDUM, That the Whole House (according to Order Yesterday taken in that Behalf) did this Morning meet, by Eight of the Clock in the Morning, in the Parliament Presence, as a Committee, to take Consideration of the Bill, intituled, An Act for the better Safety of His Majesty's Royal Person; and, after the same Bill had been by the Clerk read unto their Lordships, and some small Time spent in Consideration thereof, a Message came from the Lower House; upon which Occasion the said Committee broke off, and Prayers were said, as is accustomed, before the Sitting of the House. An Act for the Grant of One Entire Subsidy, and One Fifteenth and Tenth, by the Temporalty. The Lord Treasurer reported to the House, That himself and some other of the Lords, not as Parliament Men, but as Persons otherwise interested in the King's Service, did Yesternight acquaint His Majesty with the Effect of the Conference before, in the Afternoon, had by the Committee of this House, with the Committee of the Lower House; and shewed briefly the King's Resolution in the Matters; which his Lordship referred further to that which His Majesty had put under his Hand, and was to be imparted to the Commons, which is entered on the next Leaf. To let them know, That the Lords Committees of this House are ready to give them Answer to the Matters by them Yesterday propounded; for which Purpose, their Lordships do desire forthwith to meet with the Committees of that House, in the Painted Chamber, if it may stand with their Conveniency. That the House of Commons have entered into Consideration of the Message sent to them from their Lordships, and will return Answer by Messengers of their own. This Day, the Bill for bringing Fresh Streams of Water, by Engine, from Hackney Marsh, etc. was brought into the House, by the Lord Admiral, first of the Committees, without Alteration or Amendment. Hodie 3a vice lecta est Billa, An Act for the bringing of Fresh Streams of Water, by Engine, from Hackney Marsh, to the City of London, for the Benefit of the King's College at Chelsey. That the Committees of the House of Commons will be presently ready, and give Meeting to their Lordships, as their Lordships by their Messengers did very lately require. 1. An Act to enable Edward Nevill, Lord Bergavenny, and Sir Hen. Nevill, Knight, his eldest Son, to alien certain Lands, for Payment of their Debts, and Advancement of their Daughters and younger Sons. Returned, with certain Amendments. 2. An Act for the disuniting the Parsonages of Ash and Deane, within the County of South'ton, being presentative, and with Cure of Souls. Returned, Exped. 3. An Act for the Naturalizing of Robert Browne, His Majesty's Servant in ordinary. Returned, Exped. 4. An Act against Taxes and Impositions upon Merchants, and other the Subjects of this Realm, or upon their Wares, Goods, (fn. 1) or Chattels. 5. An Act for the better Reformation of Abuses committed by the Silk Dyers, and to restrain them from Dying Silks falsely. 6. An Act for the Naturalizing of Sir George Keere, Knight, Davyd Abircromy, Charles Chambers, David Dromond, and Roberte Mure. 7. 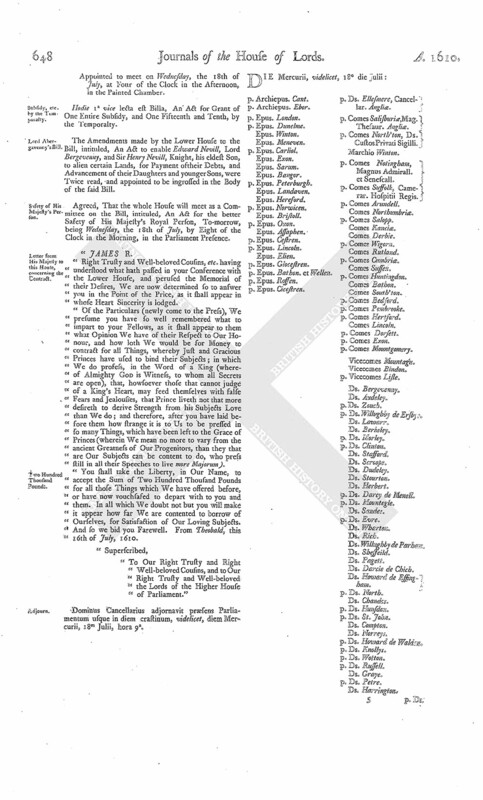 An Act for the Naturalizing of Martinus Schonerus, ordinary Physician to the Queen's Majesty, Dorothee Seelken and Engella Seelken, Two Maids of the Queen's Majesty's Bed-chamber, Katherine Benneken, Servant to the Queen's Majesty, John Woolfang Rumbler, Apothecary in ordinary to the King and Queen's Majesty, and Anna De Lobell, alias Woolfang Rumbler, his Wife. 8. 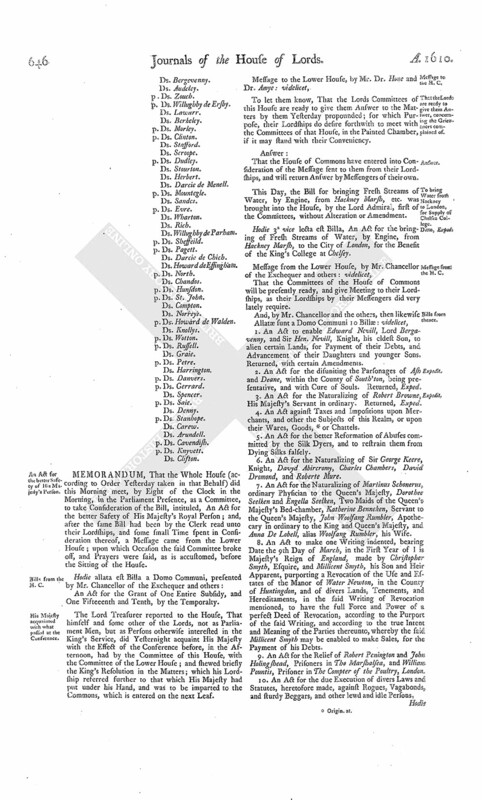 An Act to make one Writing indented, bearing Date the 9th Day of March, in the First Year of I is Majesty's Reign of England, made by Christopher Smyth, Esquire, and Millicent Smyth, his Son and Heir Apparent, purporting a Revocation of the Use and Estates of the Manor of Water Newton, in the County of Huntingdon, and of divers Lands, Tenements, and Hereditaments, in the said Writing of Revocation mentioned, to have the full Force and Power of a perfect Deed of Revocation, according to the Purport of the said Writing, and according to the true Intent and Meaning of the Parties thereunto, whereby the said Millicent Smyth may be enabled to make Sales, for the Payment of his Debts. 9. 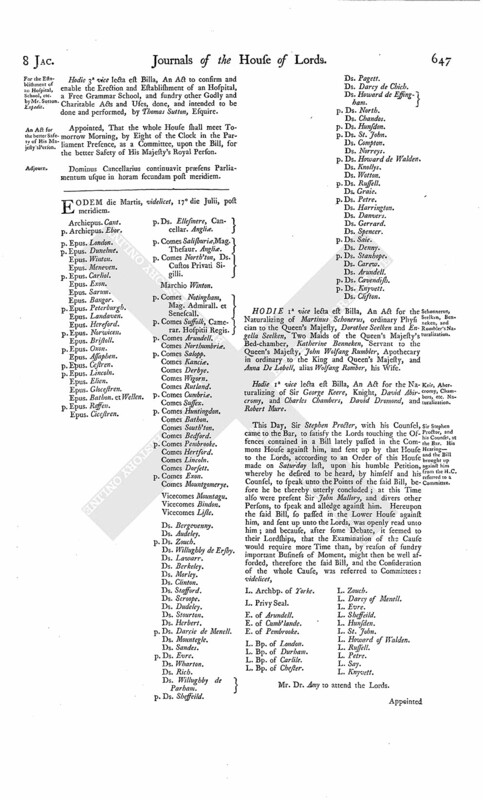 An Act for the Relief of Robert Penington and John Holing shead, Prisoners in The Marshalsea, and William Pountis, Prisoner in The Compter of the Poultry, London. 10. An Act for the due Execution of divers Laws and Statutes, heretofore made, against Rogues, Vagabonds, and sturdy Beggars, and other lewd and idle Persons. Hodie 3a vice lecta est Billa, An Act to confirm and enable the Erection and Establishment of an Hospital, a Free Grammar School, and sundry other Godly and Charitable Acts and Uses, done, and intended to be done and performed, by Thomas Sutton, Esquire. Appointed, That the whole House shall meet Tomorrow Morning, by Eight of the Clock in the Parliament Presence, as a Committee, upon the Bill, for the better Safety of His Majesty's Royal Person. Dominus Cancellarius continuavit præsens Parliamentum usque in horam secundam post meridiem. Epus. Cicestren. p. Ds. Ellesmere, Cancellar. Angliæ. p. Ds. Darcie de Menell. HODIE 1a vice lecta est Billa, An Act for the Naturalizing of Martinus Schonerus, ordinary Physician to the Queen's Majesty, Dorothee Seelken and Engella Seelken, Two Maids of the Queen's Majesty's Bed-chamber, Katherine Benneken, Servant to the Queen's Majesty, John Wolfang Rumbler, Apothecary in ordinary to the King and Queen's Majesty, and Anna De Lobell, alias Wolfang Romber, his Wife. Hodie 1a vice lecta est Billa, An Act for the Naturalizing of Sir George Keere, Knight, David Abircromy, and Charles Chambers, David Dromond, and Robert Mure. L. Bp. of Chester. L. Zouch. Mr. Dr. Amy to attend the Lords. Appointed to meet on Wednesday, the 18th of July, at Four of the Clock in the Afternoon, in the Painted Chamber. Hodie 1a vice lecta est Billa, An Act for Grant of One Entire Subsidy, and One Fifteenth and Tenth, by the Temporalty. 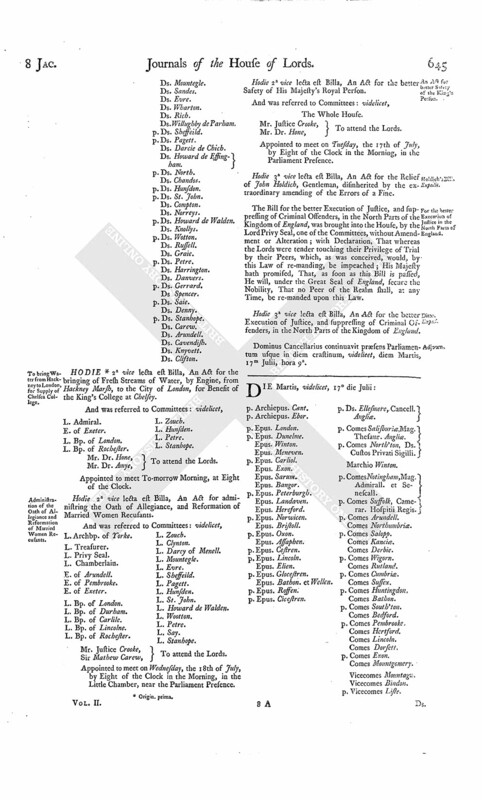 The Amendments made by the Lower House to the Bill, intituled, An Act to enable Edward Nevill, Lord Bergevenny, and Sir Henry Nevill, Knight, his eldest Son, to alien certain Lands, for Payment of their Debts, and Advancement of their Daughters and younger Sons, were Twice read, and appointed to be ingrossed in the Body of the said Bill. Agreed, That the whole House will meet as a Committee on the Bill, intituled, An Act for the better Safety of His Majesty's Royal Person, To-morrow, being Wednesday, the 18th of July, by Eight of the Clock in the Morning, in the Parliament Presence. "Right Trusty and Well-beloved Cousins, etc. having understood what hath passed in your Conference with the Lower House, and persued the Memorial of their Desires, We are now determined so to answer you in the Point of the Price, as it shall appear in whose Heart Sincerity is lodged. "Of the Particulars (newly come to the Press), We presume you have so well remembered what to impart to your Fellows, as it shall appear to them what Opinion We have of their Respect to Our Honour, and how 10th We would be for Money to contract for all Things, whereby Just and Gracious Princes have used to bind their Subjects; in which We do prosess, in the Word of a King (whereof Almighty God is Witness, to whom all Secrets are open), that, howsoever those that cannot judge of a King's Heart, may feed themselves with false Fears and Jealousies, that Prince liveth not that more desireth to derive Strength from his Subjects Love than We do; and therefore, after you have laid before them how strange it is to Us to be pressed in so many Things, which have been left to the Grace of Princes (wherein We mean no more to vary from the ancient Greatness of Our Progenitors, than they that are Our Subjects can be content to do, who press still in all their Speeches to live more Majorum). "You shall take the Liberty, in Our Name, to accept the Sum of Two Hundred Thousand Pounds for all those Things which We have offered before, or have now vouchsafed to depart with to you and them. In all which We doubt not but you will make it appear how far We are contented to borrow of Ourselves, for Satisfaction of Our Loving Subjects. And so we bid you Farewell. From Theobald, this 16th of July, 1610. "To Our Right Trusty and Right Well-beloved Cousins, and to Our Right Trusty and Well-beloved the Lords of the Higher House of Parliament." Dominus Cancellarius adjornavit præsens Parliamentum usque in diem crastinum, videlicet, diem Mercurii, 18m Julii, hora 9a.